It’s no secret that feeding your dog is one of the most important parts of pet care. But with so many dog food options on the market, choosing one that will meet the nutritional needs of your hound can be a difficult challenge. From dry dog food to wet dog food, and even organic dog food and dog food for sensitive stomachs, there are literally dozens of options to choose from. While many pet owners assume that all dog food brands are procured from the highest quality ingredients, the truth is that not all are created equal. In fact, some products are feature sub-par ingredients, such as byproducts, fillers, artificial flavors, and preservatives that can actually do more harm for your pup than they good. 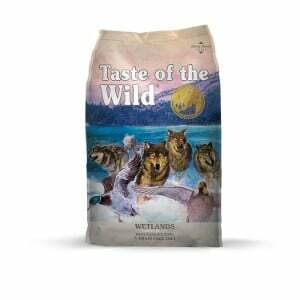 With that said, if you’re looking for a premium quality dog food that you can count on to meet all of your dog’s nutritional needs and ensure optimum health, then Taste of the Wild is an excellent brand to consider. But narrowing down the choices of this specific brand can also be tough, as they offer a variety of different formulas. To help concerned pet parents choose the best Taste of the Wild dog foods, we enlisted the help of veterinarians, as well as professionals that specialize in animal nutrition. We also read through countless Taste of the Wild reviews to find out what customers who use this brand had to say. Our research and findings have allowed us to select what we consider to be the top five Taste of the Wild dog foods currently on the market. What Sets Taste of the Wild Apart from Other Dog Food Brands? Now that you have had a sneak peak at our top picks for the best Taste of the Wild dog food choices, let’s examine each one a little closer. Below, we offer an in-depth review of each formula, including the ingredients that they are comprised of, what we like about them, and what our panel of experts and pet parents had to say. Once you’ve read through the reviews and chosen an option that you think will best meet the nutritional needs of your furry friend, click on the buttons to find the best prices currently listed on Chewy and Amazon. If you are on the market for a high protein dog food that also happens to be grain free, then you will surely be impressed by Taste of the Wild Grain Free Protein Dry Dog Food High Prairie. Protein is an essential ingredient for dogs of all ages and all breeds, as it helps to strengthen their bones and muscles. For dog breeds that are prone to issues like hip and elbow dysplasia, such as Great Danes, Saint Bernards, Mastiffs, and German Shepherds, a high protein diet is particularly important, as this vital nutrient could possibly prevent them from developing these musculoskeletal issues. 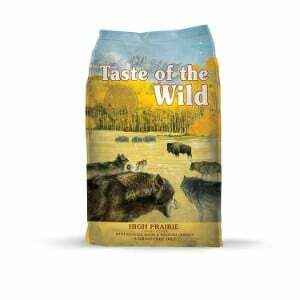 The first ingredient in this Taste of the Wild formula is roasted bison, which is an unusual choice for a dog food. In fact, Taste of the Wild is the only dog food maker that offers this type of meat in their recipes. It’s a lean form of protein, so you can rest assured that your pet will be receiving the very best nutrition possible. In addition to bison, other sources of protein include lamb, chicken, and venison. It also contains five different types of probiotics to promote optimal digestive health and strength the immune system, too. Prebiotics are also featured in this formula, as well as a variety of garden vegetables and fruits, including tomatoes, blueberries, and raspberries. 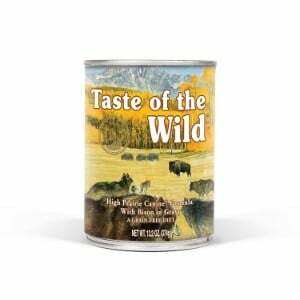 To round out the quality nutrients, this Taste of the Wild formula also contains with omega 3 and omega 6 fatty acids. In other words, when you feed your pup Grain Free High Protein High Prairie Dog Food, you can rest assured that he will be receiving all of the vital nutrients that he needs to thrive. Final Verdict: For a premium quality, high protein, grain freed dog food for your pup, Taste of the Wild Grain Free High Protein Dry Dog Food High Prairie will surely satisfy both you and your pup. It’s packed with essential nutrients and has received outstanding reviews from pet parents. 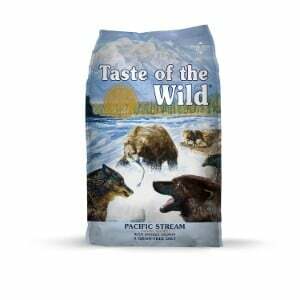 Next up on our list of the best Taste of the Wild options is their Grain Free Premium Dry Dog Food Pacific Stream. It’s so high quality and great tasting that some pet owners have said that it is like a real delicacy in the dog food world. Instead of featuring meat-based proteins, as so many other pet foods do, this formula offers protein that is procured from real salmon. It’s not only an excellent source of lean protein, but it’s also packed with amino acids and other essential nutrients that your pup needs to thrive. Other ingredients found in the Pacific Stream formula include a medley of fruits and vegetables that include the likes of sweet potatoes, peas, lentils, blueberries, raspberries, and yucca; ingredients that contain a very high nutritional profile. This formula will support your furry best friend’s overall health by offering him a bevy of nutrients, including vitamin A, a full spectrum of B vitamins, vitamin D, folic acid, and so much more! Pet owners say that they are beyond impressed with the ingredients featured in the Taste of the Wild Pacific Stream dog food, and that they have noticed that it offers outstanding results. Final Verdict: Our panel of experts and customers agree that Taste of the Wild Grain Free Premium Dry Dog Food Pacific Stream is one of the best dog food’s currently on the market; and certainly one of the leading choices from this manufacturer. It features premium ingredients, and no fillers, preservatives, or artificial flavors. Puppies need a specially balanced diet that features ingredients that will promote optimal growth. Taste of the Wild Grain Free High Protein Dry Dog Food High Prairie Puppy formula is a great option for puppies of all breeds, including West Highland White Terriers, Boston Terriers, Shih Tzus, and any other breed. It features real meat as the first ingredient, like all Taste of the Wild foods. Additionally, it also contains a wealth of other ingredients that are packed with essential nutrients to encourage the growth of your puppy. The nutrient profile includes amino acids and DHA to promote vision and cognitive health, a full range of B vitamins, vitamin A, vitamin E, vitamin D, amino acids, and antioxidants. Additionally, this formula is also free of grains; it features absolutely no corn, wheat, fillers, artificial flavors, colors, or preservatives. It’s easy to digest and will support optimal health for your growing puppy. Final Verdict: When it comes to feeding young dogs, you want to ensure that you are choosing a food for puppies that will support his growing body. With Taste of the Wild Grain Free High Protein Dry Dog Food High Prairie Puppy formula, your young furry friend will receive the nutrition he needs to flourish and grow into a happy and healthy adult. With Taste of the Wild Grain Free High Protein Dry Dog Food Wetlands formula, your furry best friend will be receiving a host of nutrients that will support optimal health. The first ingredient is protein that has been procured from duck. Duck protein is not only tasty, but it’s a lean source of protein, so it will properly support the growth of strong muscles. Final Verdict: For pet parents that want to feed their furry loved ones a high quality, high protein, grain free food, Taste of the Wild Grain Free High Protein Dry Dog Food Wetlands will be sure to please. Made with premium quality ingredients and boasting a wealth of nutrients to ensure optimal health, this formula has received rave reviews. Last, but certainly not least on our list of the best Taste of the Wild dog foods is their Grain Free Real Meat Recipe Premium Wet Canned Stew Dog Food. Featuring bison as the first ingredient, which is mixed in with gravy, your pooch will think that you are giving him a dog treat at every meal time instead of a tasty, nutritious, and well balanced meal. In addition to bison, this wet dog food formula from Taste of the Wild also features a variety of fruits and vegetables that contain omega 3 and omega 6 fatty acids, a range of vitamins and minerals, and various other nutrients that your pup needs to flourish. It’s also completely free of grains like corn and wheat, and contains absolutely no artificial colors, flavors, or preservatives. It’s easy to digest, will promote optimal health, and what your dog will love the most is that it tastes so delicious. Final Verdict: For a premium quality wet dog food, Taste of the Wild Grain Free Real Meat Recipe Premium Wet Canned Stew Dog Food is a real winner. Our panel of experts and pet owners alike are very pleased with the outstanding ingredients that this recipe features. They also say that dogs love it, and that is supports optimal health. When it comes to caring for your dog, you want to ensure that you provide him with the very best of everything; after all, he’s more than just a pet; he’s a member of your family! You’ve probably put a great deal of time into researching and selecting the best possible dog crate, the most supportive dog bed, a durable dog house, an outdoor dog kennel that offers plenty of space, and even a dog playpen that will keep your pooch secure. But while there are dozens of the above-mentioned products to choose from, one of the hardest products to select is dog food. There are so many options available, and you want to ensure that your pup is getting the maximum nutrition to encourage optimal health. For pet parents that want to offer their dogs’ the best of the best, Taste of the Wild dog food is absolutely worth the investment. But what is Taste of the Wild dog food? What makes them stand out from the dozens of other dog food brands? Why should you consider feeding your dog Taste of the Wild food? In this section of our review, we’ll answer these questions and more! Taste of the Wild is a family-owned and operates company that is based in the United States. As pet owners, the family that operates this company found that there was a real shortage of premium quality dog foods on the market that contained ingredients that dogs would naturally hunt for or forage in the wild. Taste of the Wild is the only dog food brand that creates their formulas based on what wild dogs would have eaten based on their geographic regions, including the Southwest, Canyon River, Sierra Mountains, Wet Lands, High Prairies, Pacific Stream, and Appalachian Valley. 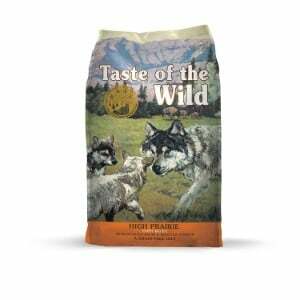 Since Taste of the Wild has been in operation, they have become one of the most highly regarded dog food producers. Veterinarians, animal nutritional specialists, and pet owners agree that Taste of the Wild is, without a doubt, one of the best dog food brands on the market. They have based their formulas on the DNA of pets, as they feel that the best indicator of an animal’s preferred foods is their genetic profile. As mentioned, Taste of the Wild’s food is based on what canines would have eaten when they were in the wild. That means that even though your domesticated dog may be living in the lap of luxury at home, he will still be able to get the very best of nutrition as if he were out hunting in the wild. It will literally bring him back to his roots. Taste of the Wild dog foods are also packed with vitamins, minerals, and nutrients that are essential for a canine’s health. These nutrients include amino acids, antioxidants, vitamin A, a range of B vitamins, vitamin D3, folic acid, and more! You love your pet like he is a member of your family. That’s why you want to ensure that you feed him the very best food possible to ensure that all of his nutritional needs are met. When you offer your pup Taste of the Wild dog food, he will be receiving the best possible ingredients that have been hand-selected to make sure that his dietary requirements are being fulfilled. With natural animal proteins, which include salmon, bison, lamb, venison, and more, a range of fruits and vegetables, and tons of vitamins, minerals, and nutrients, you can rest assured that your furry best friend will be in the best health possible. Additionally, since Taste of the Wild dog food is completely free of byproducts, corn, fillers, artificial flavors and colors, and preservatives, there’s no need to worry about any adverse reactions. Whether he has a sensitive stomach or allergies, Taste of the Wild will keep him happy and healthy. Of all of the products that are on the market for dogs, the most important product that you can choose is the type of food you feed him. Unfortunately, not all dog foods are created equal, as many of them contain a variety of ingredients that can actually be harmful to their health. But with Taste of the Wild, which only features natural ingredients and is completely devoid of fillers, grain, preservatives, and artificial colors and flavors, you will have peace of mind knowing that your four-legged family member is getting the best nutrition possible. In fact, you’ll be offering him a diet just like his ancestors would have eaten when they were in the wild! With so many formulas to choose from to suit the needs of dogs of all ages, sizes, breeds, and activity levels, Taste of the Wild is an outstanding food for dogs.